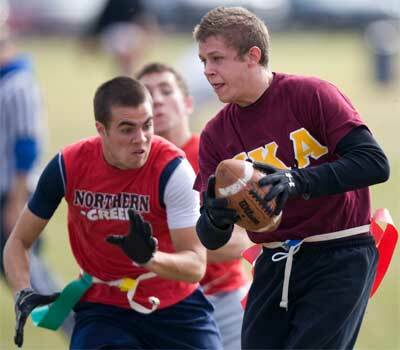 Intramural sports at NIU allow all students to partake in everyday sports as well as some that people might never have heard of before. “Our goal is to offer diverse activities and sports to get everyone involved, not just the athletes from high school,” said Rhonda Hampton, assistant director of Intramural Sports and Sport Clubs. The Recreation Services Intramural Sports Program offers many different sport teams ranging from basketball to wiffleball and even Wallyball. There are 14 different tournaments throughout the year, and almost 60 percent of the tournaments are free to students. However, there is a small participation fee to be a part of a team. Sports schedules, meetings and locations all are available online. Here’s a quick breakdown for a few listed sports. The game of Wallyball has generally the same concept as indoor volleyball with a twist of racquetball. Wallyball uses the walls of the squash court to take the ball in different directions. The basic rules of volleyball are also used in Wallyball, and the game has a minimum of four players. Wiffleball is a co-rec league that offers an A league which is competitive and a B league that is recreational. Wiffleball has the same ideas as baseball, but with faster-paced hitting, pitching and scoring. The swim meet includes events such as 200-yard medley relay followed by 50-yard breaststroke, 50-yard backstroke, 50-yard freestyle, 50-yard fly, 100-yard freestyle, 100-yard individual medley and the 200-yard freestyle relay. Sports such as flag football, indoor soccer, golf, sand volleyball, bean bags, pingpong, Ultimate Frisbee, racquetball, badminton, dodgeball, bench press and rock-paper-scissors are also offered. Students can also participate in softball, floor hockey, dead lift and Texas Hold ’Em poker. Questions? Contact Campus Recreation at campusrecreation@niu.edu or (815) 753-0231.